Let’s play spot the pygmy seahorse. Can you see it? 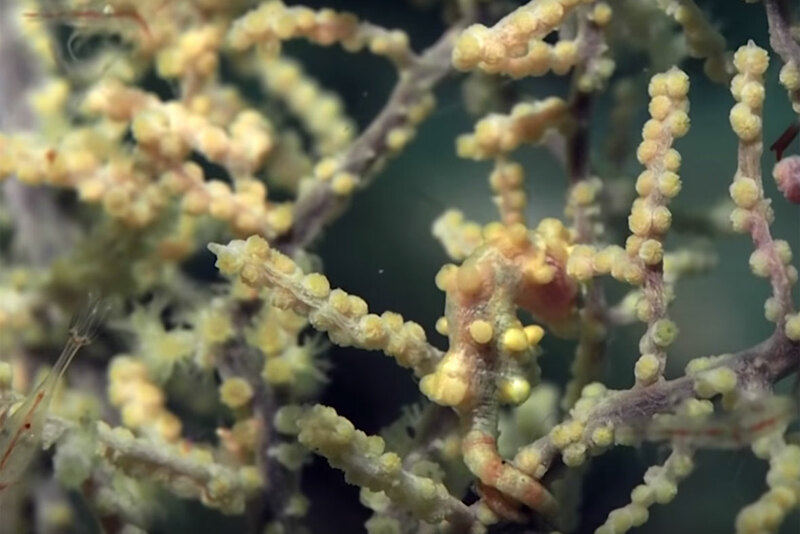 Pygmy seahorses are undoubtedly one of the ocean's most masterful camouflagers. At just two centimetres long, the tiny creatures are smaller than a paperclip, and are so good at hiding themselves that scientists only discovered the species by accident when examining one of their coralline homes that had been brought into a lab in 1969. Scuba diver Atsushi Sadaki came across these little guys while on diving trips recently off the coasts of the Philippines and Indonesia. Sadaki – an experienced diver - told Caters News that he rarely comes across yellow-coloured seahorses and considered this an unusual find. The colour, however, comes down to the coral that these animals live in. Pygmy seahorses are too minuscule and fragile to fend off predators and instead turn to camouflage to survive. They spend their entire adult lives living on a type of coral called a sea fan. 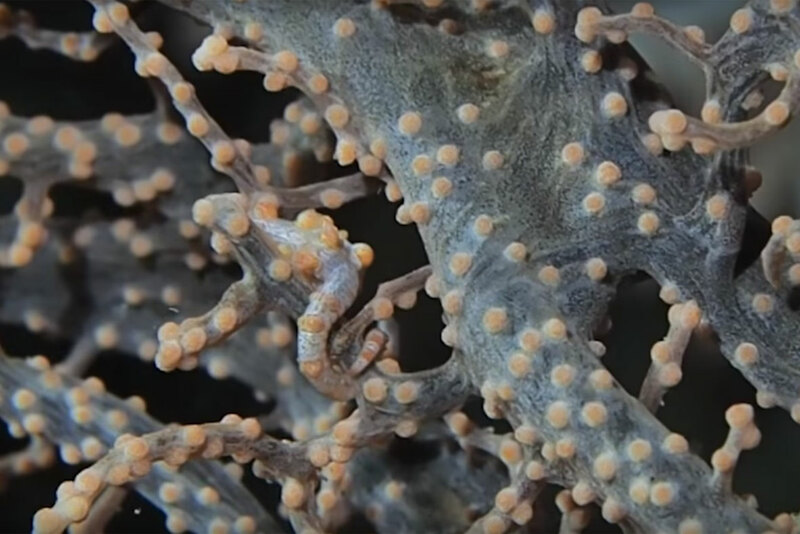 Calcium-rich bumps, known as tubercles, cover the seahorses' bodies and help them blend in with the sea fans' polyps. Two colour morphs exist in the wild: yellow seahorses with orange tubercles that spend their days hanging around the similarly coloured Muricella paraplectana, and purple seahorses peppered with pinkish-red tubercles found on the coral Muricella plectana. For some time, scientists wondered if the strange fish adapted their knobbly skin to match the coral in which they live, or if they simply drifted the ocean until they found a sea fan that matched their colour. 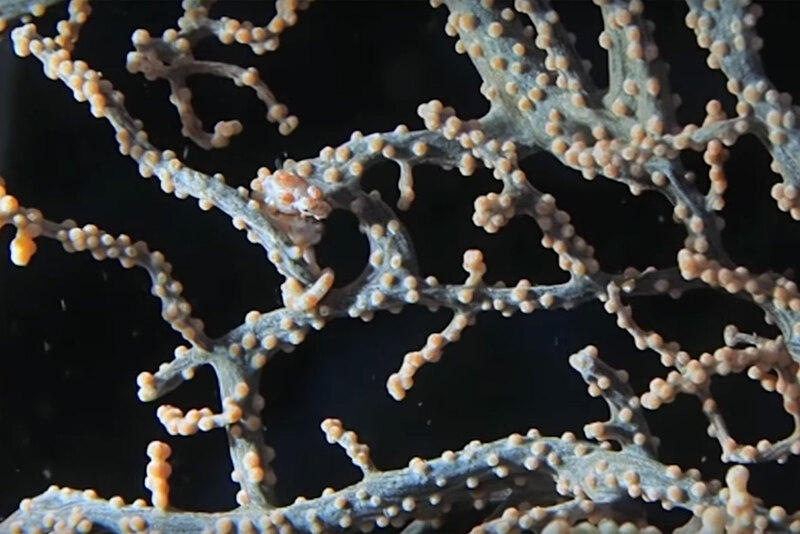 In 2014, a team of researchers from the California Academy of Sciences (CAS) scooped up a breeding pair of pygmy seahorses from a reef in the Philippines and set up an artificial home for them in a research facility – a challenge that required first spending three years raising sea fans to ensure that the couple would have suitable accommodation in the lab when they arrived. Amazingly, the seahorses bred in captivity, gifting researchers with a chance to test the babies' colour-matching skills. A brood of unfathomably small seahorses was placed in a tank with purple coral while another was given an orange home. Much to the surprise of the scientists, the animals developed differently depending on which tank they were in. London's River Thames has some tiny new residents these days: a cohort of rarely seen seahorses.